Elon Musk Testing ‘X-Wing’ Fins For Reusable Rockets, Seafaring Spaceport Drones For Landing | TechCrunch – E.R.P.S. Let’s face it: Elon Musk is probably a time traveller sent back to help us leave earth behind and achieve the next phase of human evolution. The inventor and entrepreneur issued a minor tweet storm today, in which he detailed a new SpaceX program to test the function of “X-Wing” style grid fins that could help spacecraft navigate upon re-entry after delivering personnel or cargo to an orbiting space station. 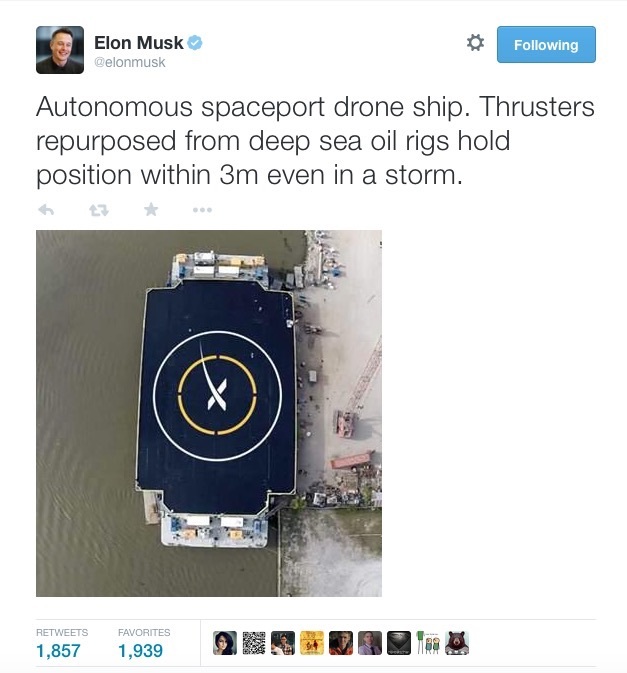 Here, in chronological order, are Musk’s own tweets describing the tech, which, also includes an autonomous seafaring drone spaceport platform, to give them a landing pad that can hold its position within three meters’ distance even in the heart of a raging storm. These new modifications to the rocket should make atmospheric navigation easier, with each fin operating independently to help control the craft’s angle, speed and vector. They also fold up and stow during takeoff, so they don’t add any additional drag. The autonomous spaceports are essentially seafaring landing pads, which can help make sure that re-entering craft are far from any populated areas in the event of any incident, while still providing a stable target for landing spaceships.